This recipe is once again somewhat Fall related, but is great any time of year. The benefit lies in its ease of preparation, and great flavor. Any ingredient can yield great food via the appropriate steps, cooking processes, seasoning, and so on. This recipe does not require much. It’s a few ingredients, one cooking process, and a couple easy techniques (reducing and glazing). If I were to characterize recipes’ difficulty as beginner, intermediate and advanced, this would lie in between beginner and intermediate. In other words, if you love to cook, this should pose no challenge. Glazing is an interesting culinary term. A glaze is a coating of something, usually sweet, usually highly seasoned. When we glaze, usually it occurs during the cooking process, as opposed to a finishing step, because we want the glaze to permeate and we want it to cook. It’s a glaze, but also our dominant flavor profile. Most times, our glaze is a thick sauce, sometimes sweet and sour, that we make separately and add while the main ingredient is more than halfway cooked. In this instance, the glaze is naturally occurring, resulting from a reduction of our cooking liquid. The flavor sinks in to the carrots, and when no liquid is left, a glaze is formed. In my opinion, it is the most appropriate method by which to finish carrots (or any glazed root vegetables). It enhances and augments the natural flavor of the ingredient, without adding unnecessary or excessive sugar, salt and fat. Simmer means simmer. Do not boil because it takes less time. Do not begin with too much liquid. You will quickly discover that a little goes a long way. And really, how complicated is that? Evenly sized carrots, a proper simmer and don’t use too much liquid. Those are the keys to success. Use a small heavy bottom sauce pot for this. Cut the carrots into equal sized pieces. I like to start with 1/2 inch pieces, cutting the thicker ends in half. Place the carrots, butter, sugar, salt and orange juice in the sauce pot. Add just enough water to ALMOST cover. You want a few edges of the carrots to be exposed. Once you begin cooking, they will release their own liquid and will be covered enough to cook properly. Bring to a simmer. This means a few bubbles every second or two. Boiling will turn the carrots to mush and will force flavor out of the carrots into the broth. Cook until liquid is almost gone. When liquid is almost gone, remove thyme and turn heat to high. The residual butter and sugar will naturally begin thickening and glazing. Cook, stirring gently but continuously until the carrots are glazed. Do not cook until caramel forms. Remove from heat, toss in the parsley and hold warm until ready to serve. This is of course a side dish, and compliments so many things well. Most appropriate are fall/winter roasts, potato dishes, green beans with garlic, and of course, thanksgiving dinner. A great benefit of doing carrots this way is that they will hold warm for a few hours before serving. I use regular granulated sugar because I like the natural flavor of carrots to shine. But, feel free to experiment with honey, maple syrup, agave nectar, or any other sweeteners. 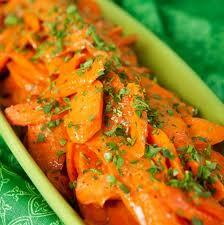 You can also add a touch of ginger, walnuts, pecans, tarragon, or anything else you enjoy with sweet carrots.